Doncaster Rovers came from behind to beat play-off rivals Peterborough United and ruin Darren Ferguson’s return to the Keepmoat Stadium. The visitors struck the first blow in an incident-packed and, at times, bad tempered clash when George Cooper curled home after six minutes. But Posh left back Tyler Denton was sent off just before half time for two bookable offences and Rovers roared back for a victory which saw them leapfrog Ferguson’s side into sixth place. 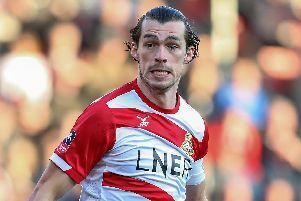 Ben White’s own goal got Doncaster back on level terms before John Marquis and Kieran Sadlier fired Grant McCann’s men to a valuable victory. Despite falling behind early in the game, Rovers arguably edged the first period but Posh threatened from set pieces and on the break. Denton’s sending off changed the dynamic of the contest and Doncaster made full use of their numerical advantage – much to Ferguson’s frustration on his 47th birthday. Posh seized the initiative after just six minutes with an impressive curling finish by Cooper from the edge of the box. But it was a soft goal from Rovers' perspective as Mallik Wilks was guilty of giving the ball away in a dangerous area when he had the option of an easy pass to a teammate. Wilks almost made amends on the quarter hour when his dangerous inswinging cross was poked wide by Marquis. The visitors survived a major scare midway through the first period when Denton misjudged a header back to goalkeeper Conor O'Malley and was relieved to see it hit the post. Wilks was Doncaster's main outlet and his close range effort following a slalom run brought the first save out of O'Malley. The Leeds United loanee was then hacked down by Denton - resulting in the Posh left back's second yellow card - before being booked himself after going head-to-head with Ivan Toney. The action was unrelenting following the re-start as Marquis had a decent case for a penalty before seeing a shot diverted wide by O’Malley and then missing the target with a glorious headed chance. At the other end, following a quick break and superb cross from Joe Ward, Marko Marosi had to make a good reaction save to keep out Toney’s header. It looked like it might one of those days when it might not fall for Doncaster. But within a flash, and with some good fortune, the home side turned the game on its head. Rovers’ deserved equaliser arrived on 62 minutes when Andrew’s inswinging corner went in off White at the back post. Three minutes later Marquis was on hand to fire Rovers ahead from close range after Wilks had hit the post after rounding O’Malley; the ball falling kindly for Rovers’ leading scorer after then bouncing off a Posh defender and hitting the other post. Substitute Sadlier made the points safe on 74 minutes when he broke in through the left channel and finished superbly – with Posh arguing Rovers should have stopped the game to allow treatment for Ward who was injured but already off the pitch. Marquis and Tyler Smith had chances to extend Rovers’ lead but it was another job well done for McCann’s men who remain unbeaten at the Keepmoat since October. Rovers: Marosi, Lewis (Blair 59), Anderson, Downing, Andrew, Whiteman, Kane, Crawford, Coppinger (Sadlier 68), Wilks (Smith 78), Marquis. Subs not used: Jones, Butler, Rowe, Blair, Smith, May. Peterborough: O’Malley, Naismith, White, Bennett (Tafazolli 71), Denton, Woodyard, Cooke (Reed 71), Ward (Dempsey 76), Cooper, Maddison, Toney. Subs not used: Chapman, Godden, Stevens, Knight.